For the first week of December, our tree was up & "glowing", as Jack put it. With Andy's travel schedule, we decided it would be easiest to decorate in phases. This past weekend we finally pulled out the boxes of ornaments, turned on the holiday music & decorated our glowing tree. Andy & I love going through the ornaments from our childhood as well as family ornaments from several generations ago. There are glass ornaments from his grandmother, ones that we created when we were Jack's age and the ones we've collected as a family. Amazing how seeing an ornament from the 1970s can take you back to the first Christmases you can remember. I look at our newer additions and wonder if they'll hold the same meaning to our kids once they're grown. 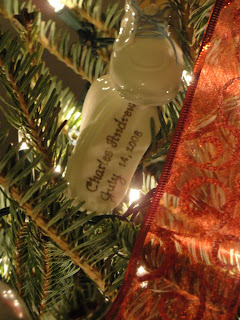 I imagine Jack explaining to his wife that in 2009 he was potty-trained, as his ornament most obviously suggests... or Charlie explaining his mom's love of the more crafty variety. And while most people have a pickle, ours has special meaning as it was given to us as a wedding present from a dear friend who passed away this year. After about an hour of tree decorating & strolling down memory lane, Jackson was over it. He was no longer interested in our stories & had switched gears, now wanting to play Play-doh. When told he could play *after* mommy & daddy were finished with the tree, he threw his hands up in the air, said "whatever" and walked out of the room. Such a grown-up statement for a small guy! It's funny because I know I've done that at least a dozen times over the past few months. So there's no denying where he learned it! It gave Andy & I a good laugh, as well as a slight peek at what it may be like one day to have teenagers in our house. The nostalgia that is encompassed in those ornaments for me is incredible. Who knew glass and clay and wood could bring childhood rushing back so quickly. I hope our kids get that when they are older. Decorating the tree is like opening a time capsule every year. Such fun!